My flight to Paris was an overnight trip, so we arrived into CDG around 6:30 in the morning. When I boarded the plane I was struck by how ancient the vessel was, looking straight out of the 80’s and in dubious condition for trans-Atlantic travel. The girl behind me had the same thought and she and I and the stewardess began laughing about it and exchanging travel stories. Next thing you know, I’d made a new friend, and Michelle and I spent the next few days intermittently exploring the city together. It’s easy enough to get along with fellow adventurous spirits. If this is what solo travel is like, it's pretty great, I thought. We took an Uber together to our hotels and since unsurprisingly my room wasn't ready to check into so early in the morning, I dropped my bags and just began wandering around the neighborhood. Per a recommendation from Ashley, I was staying at the Hôtel Caron de Beaumarchais, a lovely little boutique hotel in the heart of Le Marais. I could barely make it five steps out of the hotel without stopping to take photos, so needless to say I didn't make it all too far. 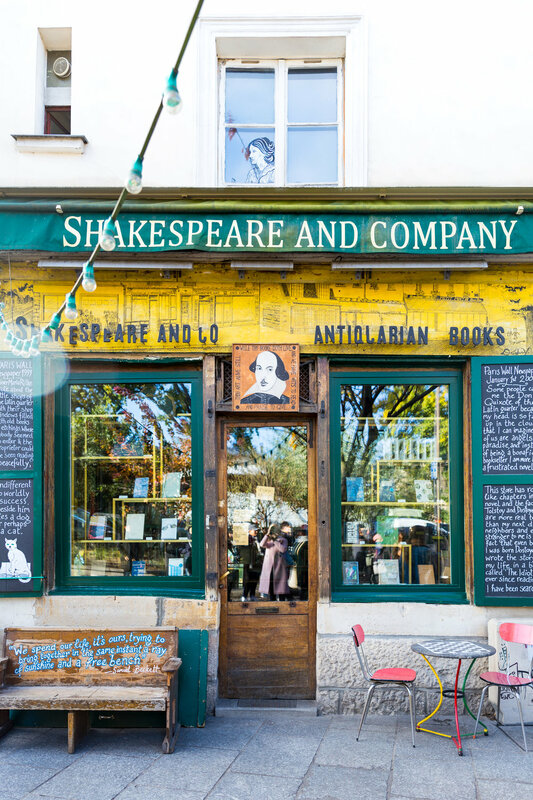 I crossed the Seine past Notre Dame and then stopped for breakfast at the Shakespeare and Co. Cafe. I ordered an avocado toast and as I sat down "New York, New York" started playing on the radio and everything felt very serendipitous. I then walked into the infamous Shakespeare and Co. bookstore and was enthralled wandering through the stacks and stacks of books. I could have happily spent days in there reading in the little corners hidden all over the store but I tore myself away to explore more. I wanted to make the most of this solo travel alone time. I began walking along the Seine. 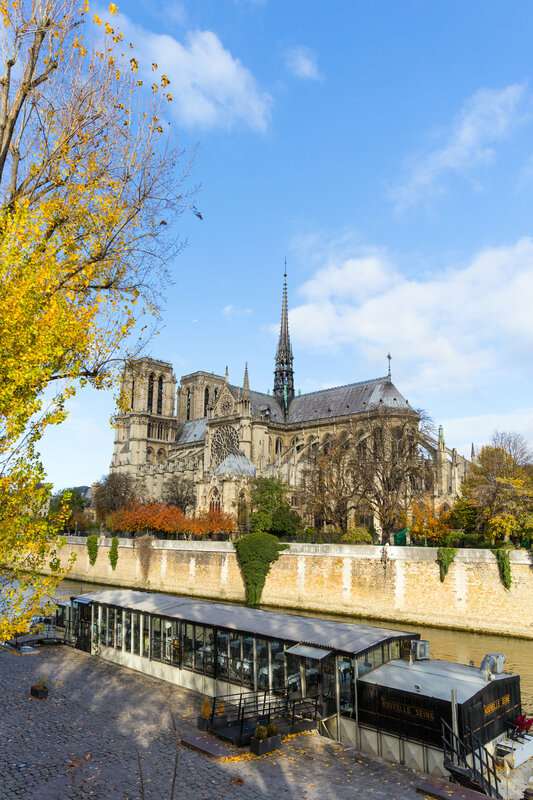 I was admiring the buttresses of Notre Dame from every angle and snapping a ton of photos when I got a call from the hotel that my room was ready. When I arrived, I was given a key for the top floor and was excited to see what awaited. The room was so incredibly charming! An adorable little bed stuffed in between two closets, a tiny bathroom to the right, and a small desk to the left in the opposite corner. The ceiling was exposed wooden beams from the roof and a little chandelier hung right in the center over the bed (which I definitely bumped my head on a couple times). The antique decor felt like I'd stepped back in time yet modern touches like USB chargers by the bed and free wifi kept me just enough in the present. And the pièce de résistance? The balcony! When I booked this trip last minute and was recommended this hotel I reserved the last room, adding a note under special requests for a balcony but not expecting to actually get one. Yet there it was, the cutest little Parisienne scene of white iron table and chairs overlooking the rooftops, which I used regardless of how cold it is outside. Sipping hot coffee on a cold day while nibbling on a fresh croissant with a "French Cafe" Spotify playlist strumming softly in the background is truly an ideal Parisian morning. The funniest part of this so-called solo travel experience is that I didn't wind up spending much time alone at all. I got settled into my hotel and headed right out to meet up with a friend, who showed me around some more. We walked along the Seine to the Louvre, up to the Palais Royal, got a coffee at Cafe Kitsuné, grabbed a bite to eat at Colete, and just strolled through the city. The day ended in a gorgeous sunset over the Place Vendôme before we hopped onto the metro and I went to bed early, anticipating an early morning. 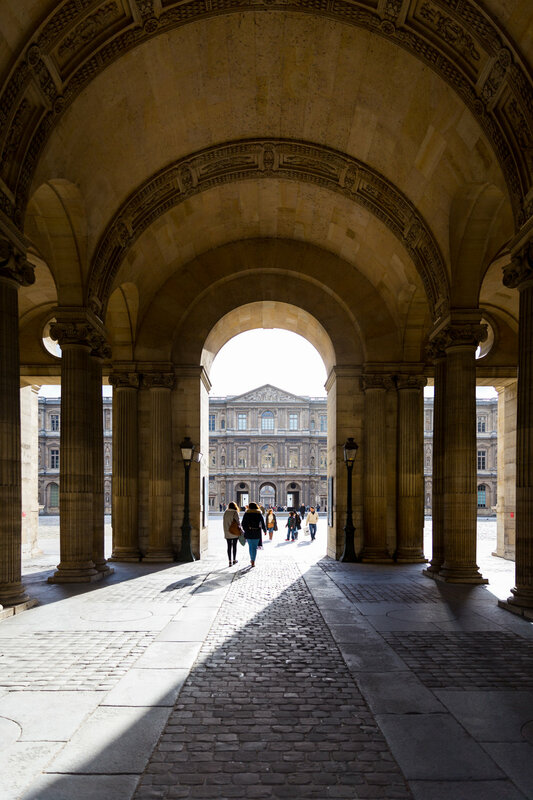 The following morning I headed to shoot with a photographer I've been following for awhile now on Instagram and we took some incredible photos in and around the Tuileries Gardens. She was impressed I'd chosen to spontaneously solo travel and was so sweet to offer any recommendation I might need. Later, after the shoot, I switched into a comfy pair of over-the-knee boots and grabbed my favorite tote bag to explore more of the city. I met up with Michelle and we wandered around Le Marais, grabbing lunch at the best falafel place (if there's a line, as there often is, it's faster to take a seat inside). 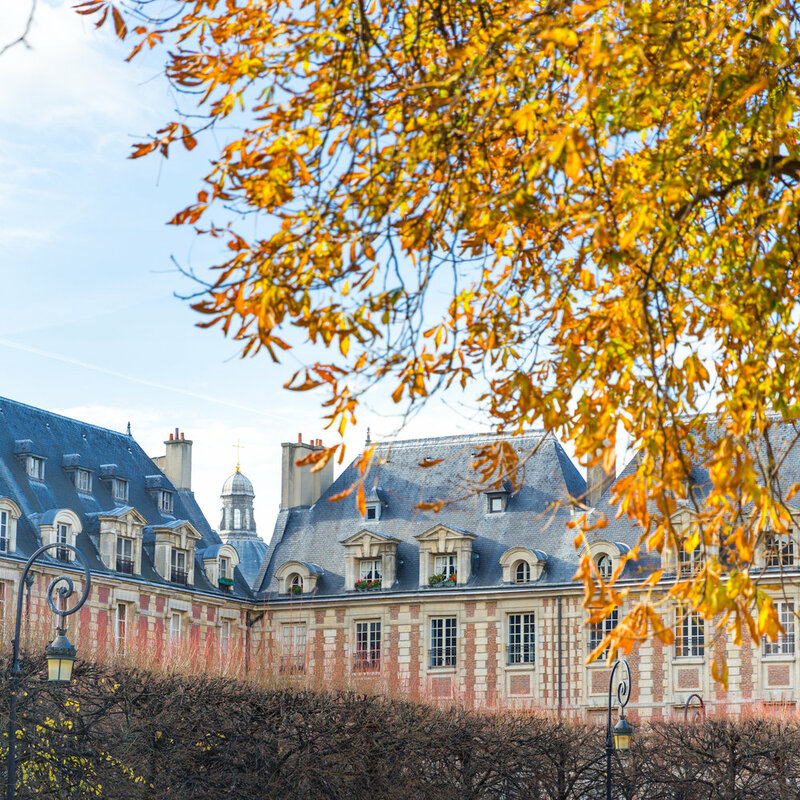 We then meandered over to Place des Vosges and onto the metro, where we eventually stepped off at the Musee d'Orsay. 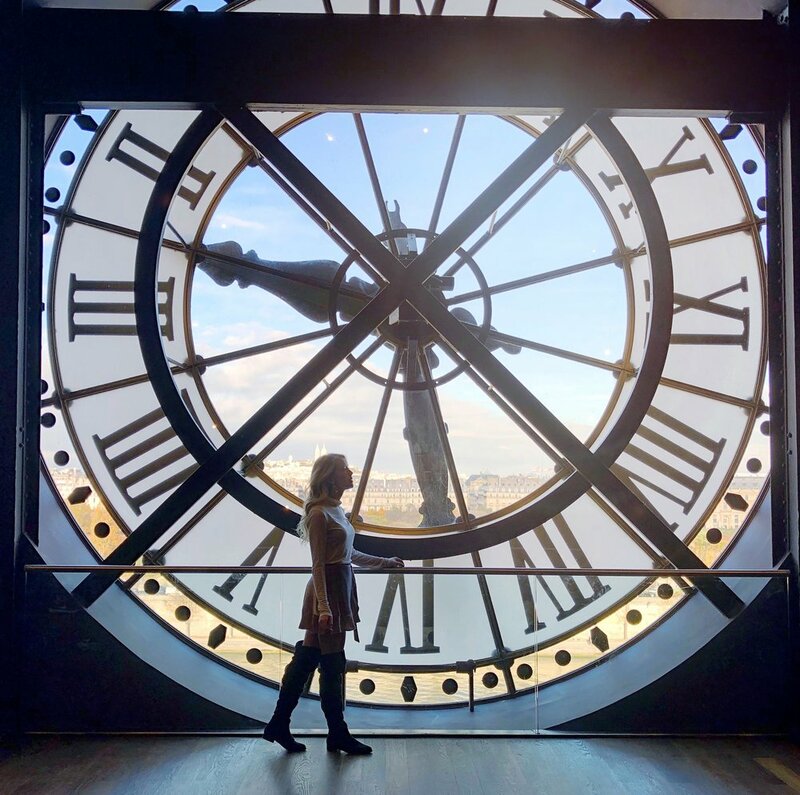 I'd be lying if I said we didn't go there just for the clock photo, but we stayed a little while to admire the impressionism. After that, we began strolling around the area, referencing Ashley's Paris map to see what was nearby. We decided to get tea at Ladurée and made our way there, sitting and chatting awhile once inside to warm up. Next we hurried to the Seine in an attempt to see sunset behind the Eiffel Tower but by the time we'd walked to the Pont Alexandre III the sun had gone down and dusk set in. Again, we began to wander around following Ashley's map, and eventually wound up standing right under the Eiffel Tower just as the light show began to twinkle above us. Everything about it felt surreal and both of us exclaimed "We're in Paris!" as if neither of us had fully realized it until then. What a gorgeous city and a wonderful day making new friends and enjoying the magic that surrounds Paris. Thanks to HLV Photography and to Michelle for the photos!